So, you are going to HELI-EXPO. Great! What’s it all about? HELI-EXPO, hosted by Helicopter Association International (HAI), is a range of events centered around a three-day exhibition that includes about 700 exhibitors and 18,000 attendees. It is a once-a-year opportunity to meet key decision-makers and hiring managers, attend education and safety courses, learn about aircraft and product updates, make new industry friends, and gain a wealth of knowledge from every aspect of helicopter aviation. Whether you frequent the show or are attending for the first time, you’re new to the helicopter industry, transitioning from the military, or seeking a new career opportunity, there is always something new to see, do or learn. Here are tips from Janie Foster, networker extraordinaire, for navigating the show to maximize your experience. This is a REALLY BIG SHOW, and it’s almost impossible to see it all in three days, so plan to “work” HELI-EXPO, and go sightseeing or meet with local friends before/after the show. 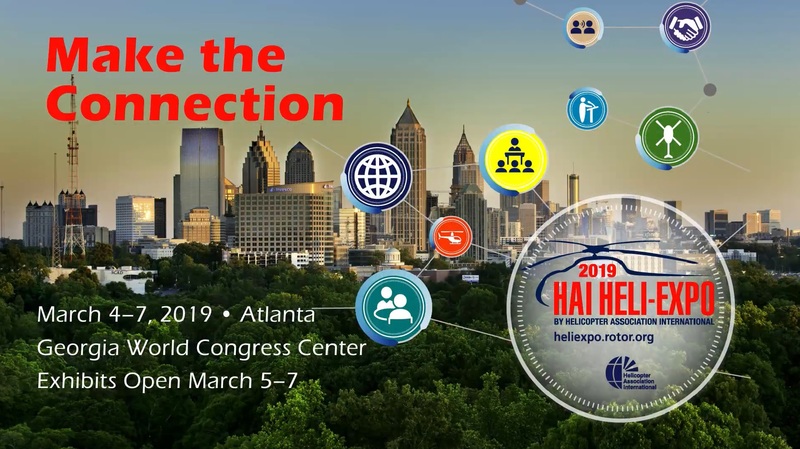 •	Download the HAI HELI-EXPO 2019 app from the HAI website. Use the app to set up meetings, classes, events, note the booths you want to visit, keep track of people to meet, research products, find out about organizations to join, set up your profile, etc. The app also provides meeting reminders, updates on events, exhibitor booth locations, event schedules, and more. •	Which companies interest you? Who do you want to meet? What segment of the industry are you pursuing? Study the full schedule (https://www.rotor.org/home/heli-expo/attend/schedule) and exhibitor list (https://www.rotor.org/home/heli-expo/exhibit/info/show-floor/show-floor-info) to set up your game plan. •	Business cards are a must, even in today’s digitally connected world. Keep your cards professional, simple, and easy to read, with non-glossy card stock and space on the back for notes. Try to avoid using stock helicopter photos from printing companies. •	Looking for a new job, or starting a project? Write and rehearse your 15- to 30-second introductory statement or “elevator pitch.” Make it concise, clear, and conversational, and rehearse your pitch out loud until it sounds natural and confident. A well-crafted pitch will come in handy as you may have only a short amount of time to catch someone’s attention. Check the internet for more on elevator pitches. This event celebrates our 2019 scholarship winners, and the Livingston and Emeritus Circle Award recipients. All Whirly-Girls meetings on Monday will be held at the Georgia World Congress Center in room B316. Everyone is welcome to attend. This popular kick-off event is attended by people with titles from all aspects of the industry: chief pilot, director of operations, director of maintenance, safety director, senior level executive, aviation consultant, base manager, lead pilot, line pilot, aviation maintenance technician, hiring manager, recruiter – you name it. •	A 3-day show pass includes a ticket to the reception and a complimentary beverage ticket. •	Arrive at the starting time to meet more people. Many attendees stay a while and then leave for planned or impromptu dinners. Who knows – you may get invited to join a dinner group! Arrive on time, and take advantage of the opportunity to chat with people in the buffet line. Great food is served here too! •	Select a seat next to people you don’t know. Introduce yourself, and strike up a conversation. •	Stay for the entire meeting to get the most out of it. Preregistration is required, so don’t forget to sign up! •	Review the Career Fair exhibitor company list. Be sure to study the company websites prior to the fair. •	Career fairs are mini interviews in disguise, so be prepared! •	Prioritize companies you want to visit. Be first in line to get ahead of your competition! •	Arrive at the start of the event. •	Have plenty of copies of your resume on hand; recruiters may ask questions and jot notes on your resume for later review and sorting. •	Have your “elevator pitch” ready. •	Exchange business cards with hiring representatives. Send a follow-up email immediately after the Career Fair – you may see these people again during the show, and it will help them remember you. The Rotor Safety Challenge is a collection of FREE educational safety events. It is an easy and economical way to learn industry best practices, including safety tools and techniques you can apply on the job. You can receive WINGS and AMT credits from the FAA for each of the presentations (see faasafety.gov). Additionally, if you attend six of the sessions and collect a token, you can redeem these tokens for a certificate of recognition. •	Exploring the expo hall is a great way to learn about companies, products, and industry developments. While visiting exhibitor booths, listen, ask questions and introduce yourself to other booth visitors as well as exhibitors. Keep in mind the booth exhibitors are at the show to sell products and services, so don’t tie up the conversation. Be cordial, exchange cards, then move on. •	Seek out community lunch tables located around the convention hall. Join a table and introduce yourself. Plan to have lunch at the busiest times to meet more people. •	Be on the lookout for exhibitor special announcements and mini-events at booths, such as unveiling of a new aircraft, announcements about new technologies, the signing of aircraft purchase contracts, new product introductions, etc. Note some events are open to everyone, and others are by invitation. •	The convention shuttle buses are great for networking, whether you’re standing in line waiting for a bus, or riding to and from the show. •	You may find yourself sharing on-the-spot Uber, Lyft or taxi rides with other attendees – great connections are made this way! •	After the convention hall closes each day, proceed to the lobby lounge at the key convention hotels. The Wynn and Encore are the HELI-EXPO headquarter hotels. It’s easy to start one of those casual conversations that can lead to dinner gatherings and valuable contacts. •	After evening events such as business dinners, the HAI Member Reception, the Salute to Excellence Awards dinner, vendor parties, etc., people migrate back to these same hotel lobbies and cocktail lounges for more conversation. •	Strike up a conversation at events while standing in line for food and beverages. •	Read the “show daily” magazines for up-to-date happenings. You’ll find them in convention hotel lobbies, and they are handed out as you walk into the convention center each day. •	You’ll find some neat swag at the exhibitor booths. Collect items gracefully! This isn’t Halloween – don’t hold your convention canvas bag open and sweep in a pile of items. •	If it’s a really cool gadget, don’t ask for nine more. Usually exhibitors will give you one and possibly one extra. •	The last day is a good time to gather items since exhibitors typically don’t want to re-pack and pay to ship items (again). Let them make the offer to take more items. •	Many exhibitors hold drawings for items like iPads, fitness watches/trackers, GoPro cameras, headsets, leather flight jackets, etc. This is yet another good reason to have professional business cards. •	The convention halls are often chilly. A suit jacket or sport coat for men is usually sufficient; women, wear a tailored jacket or sweater – keep it professional. •	Wear comfortable, professional-looking and well-maintained business shoes. With over 700 exhibitors in about a million square feet of exhibit space, you’ll be glad you did! •	Enjoy yourself, but skip the hangover…and get some sleep!